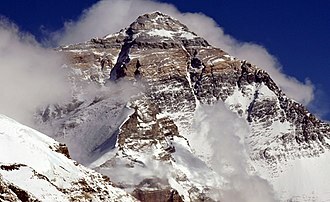 The main article for this category is Mount Everest. 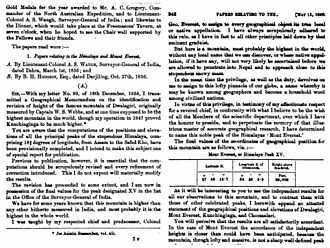 Pages in category "Mount Everest"
The Geneva Spur, named Eperon des Genevois and has been called the Saddle Rib is a geological feature on Mount Everest—it is a large rock buttress near the summits of Everest and Lhotse. 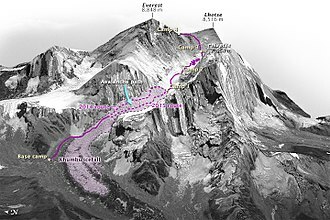 The Geneva spur is above Camp III and the Yellow Band and it is a Spur near the south col. A related formation is the saddle between the peaks of Mount Everest and Lhotse, the spur is between about 25,000 and 26,000 feet altitude. 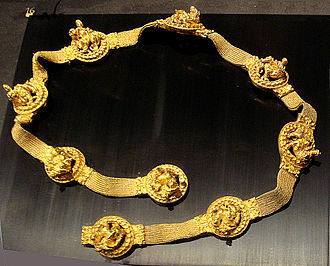 The Geneva Spur name comes from the 1952 Swiss Mount Everest Expedition, the spur provides a route to the South Col, and is usually traversed by climbers heading for Lhotse or Everest summits. 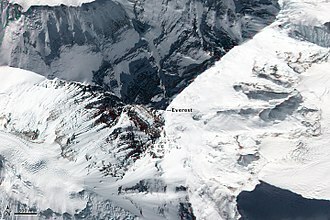 From the top of Geneva Spur, South Col can be seen, Lhotse climbers typically head southeast from Geneva Spur, and on to a couloir to ascend that summit. Far bigger than it looks from a distance, Geneva Spur was a mixture of snow. 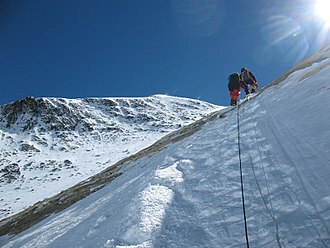 The Geneva spur is above the Yellow Band, on the Southeast Ridge climbing route, the Genava Spur lies below Camp IV - and above Camp III, the spur provides a route to the South Col, and is usually traversed by climbers heading for Lhotse or Everest summits. Asian Trekking is a commercial adventure company based in Nepal started by Sherpa Ang Tshering. Ang Tshering was one of the first graduates of Sir Edmund Hillary’s school, Asian Trekking is based out of Kathmandu, Nepal. 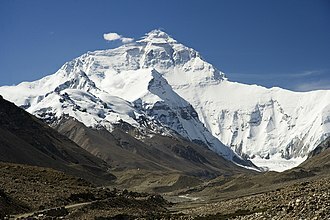 In 2001, it was recorded that Asian Trekking ran 25 large mountain expeditions per year, in particular, they are known for supporting treks to Mount Everest. Asian Trekking made international news when in 2006 four of its clients, one of the clients, David Sharp, died near the summit and this event became the center of an international climbing ethics controversy. 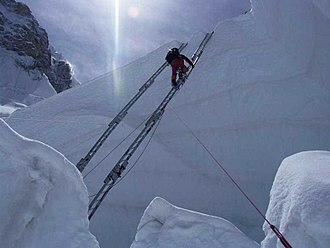 Ang said that climbers can die if they use all their energy getting to the summit of Mount Everest, Asian Trekking is known in mountaineering for providing logistics only Everest expeditions, although cheap, do not offer a lot of extras higher up the mountain. Logistics only, compared to guided or even non-guided climbs, is cheaper and gives climbers more freedom. 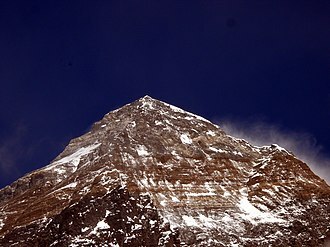 Asian Trekking sells unguided Everest expeditions for both the north and south side, but they are oriented towards supplying basic supplies and expedition organization such as hiring a local sherpa, Asian Trekking has organized multiple years of Eco Everest Expeditions, and often provides logistics for many expeditions. Asian Trekking supported the 2001 International Everest Expedition, sadly they lost one person, Lhakpa Nuru who died was supporting the Eco Everest Expedition. One tragic year was in 2006 when multiple clients died including David Sharp, Vitor Negrete, Thomas Weber, in addition, two Asian Trekking Sherpas were killed on April 21,2006 in a serac fall on the south side, Lhakpa Tseri and Dawa Temba. At the time of his death, David Sharp was found to be in possession of a receipt for US$7,490, fully guided expeditions are between thirty to one hundred thousand US$ plus an additional twenty thousand in other expenses that range from gear to bonuses. Asian Trekking services are cheap because they end at base camp. 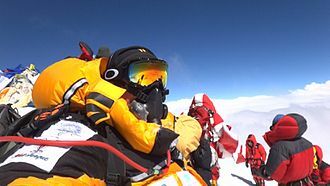 However, Brazilian Vitor Negrete, climbing with Asian Trekking and possibly teaming with Sharp, in Vitors case he developed medical problems returning from the summit and died in the arms of his Sherpa assistant. Asian Trekking has supported expeditions on the North and South sides of Mount Everest, Asian Trekking has supported International Dream Everest and Eco Everest Expedition trips to Mount Everest. 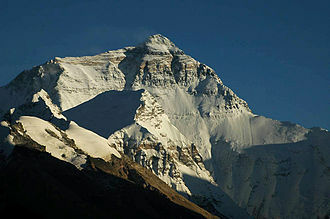 The Lho La is a col on the border between Nepal and Tibet north of the Western Cwm, near Mount Everest. 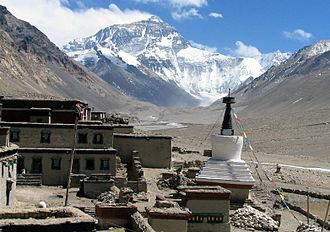 It is at the lowest point of the West Ridge of the mountain at a height of 6,006 metres, however, as the glaciers declined the favoured trade route became the Nangpa La, to the west. 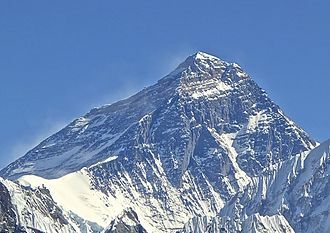 This would allow the South Col to be called Lho La as it is the col south of Everest, unfortunately the Nangpa La had been called the Khumbu La in the past and was still sometimes being called by that name. British sentiment was against the name changes and the new names never stuck. 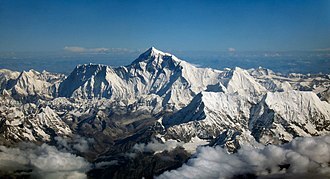 The first western explorers to discover the col were George Mallory and they were exploring the West Rongbuk Glacier in Tibet hoping it might give access to a route for reaching the summit of Everest. They named it Lho La, meaning South Pass simply because it was to the south of where they were and this rather self-centred decision was to give difficulties later, as mentioned above. 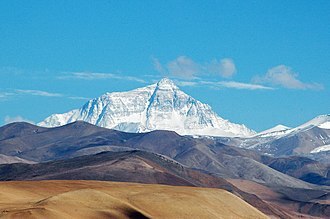 Lho La gave access to Everests West Ridge and to its Western Cwm, by 1951 Chinas occupation of Tibet and the opening of Nepal to foreigners meant that Everest was only accessible from the south. Expedition Everest — Legend of the Forbidden Mountain is a steel roller coaster built by Vekoma at Disneys Animal Kingdom theme park at the Walt Disney World Resort in Lake Buena Vista, Florida. The ride is themed around the Yeti hiding in Mount Everest and it is listed in the 2011 book of Guinness World Records as the most expensive roller coaster in the world. 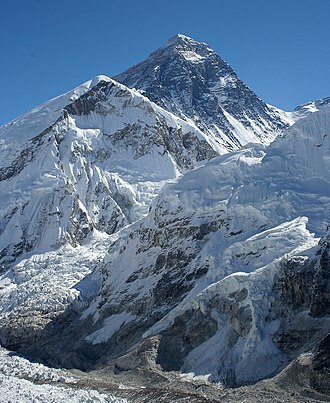 Including sets and extras, its total cost was reported to be US$100 million, following 6 years of planning and it is the tallest artificial mountain in all of the Walt Disney Parks, though contrary to popular belief, Expedition Everest is not Floridas tallest mountain. It is Disneys 18th mountain-themed attraction, the attraction first was announced publicly on April 22,2003, during an event to celebrate the fifth anniversary of Disneys Animal Kingdom. It took three years and more than 38 miles of rebar,5,000 tons of structural steel, and 10,000 tons of concrete to build the mountain. Expedition Everest first opened for previews on January 26,2006, the attraction features a stand-by, Fastpass+, and a single rider line. The queue starts at the office of the fictional Himalayan Escapes travel agency, visitors next enter a tea garden, followed by a room with equipment from a successful expedition, and the Yeti Museum, which contains information on the Yeti and a moulding of a Yeti footprint. There are about 8,000 artifacts brought from the Nepal trip in the museum, the single rider line skips all of the exhibits. The riders board the coaster in the model village of Serka Zong. The train departs the station to the right and climbs a small lift leading to a drop, circles around to the 118-foot lift hill. It is the tallest attraction at Walt Disney World, beating The Twilight Zone Tower of Terror by 6 inches, on the way up it passes through a ransacked temple with murals of the yeti, warning the riders that the mountain is his territory. At the top of the mountain the train curves around the main peak, when it emerges, it draws to a halt in front of track that has been torn apart, presumably by the yeti. The train itself is held in place by a series of rubber tires while an automatic switch rotates the piece of track directly behind the train. Everest's grave, St Andrew's Church, Church Road, Hove. Sir George Everest's House and Laboratory, also known as Park House. Park House as seen through weathered Tibetan Buddhist prayer flags, placed by Mussoorie's longtime Tibetan community, from a vantage point at an angle above. Ueli Steck, who died following a fall in a practice climb. 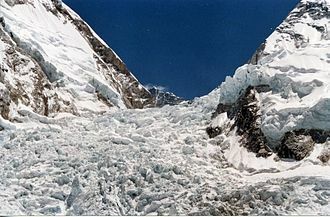 This labeled photo-diagram shows the location of the fatal ice avalanche on the 2014 route, and the revised 2015 route through the Khumbu.